As the school year draws to a close, many teachers have to remove everything from the walls to move classrooms in the coming school year or for summer cleaning. In almost every K-8 classroom I visit, word walls occupy key real estate in the room. Even many high school teachers devote some wall space to key words from the unit. If you are taking words off your wall at the end of this school year, I encourage you to consider how you will use those words again next year. Did your word wall provide thematic, visual support for key vocabulary from the latest unit? Were the words organized according to concepts? Did the students help create the visuals and concept maps? If you answered ‘no’ to any of these questions, you might want to try an interactive word wall in the coming school year. Interactive word walls change with each unit, feature student created visuals, and are organized conceptually, not alphabetically. To help you plan your interactive word wall for the coming school year, check out this video explaining how to set them up. I also encourage you to keep some of those words off the walls, so they can become interactive learning tools. The following three strategies help students acquire new vocabulary through interactions and making connections. For each strategy, students should create a set of vocabulary cards on note cards with visual cues for each word. These cards may be created throughout the unit, so that students have a complete set by the end of the unit. Vocabulary cards, rather than vocabulary lists, work better for each of these strategies. Have students work in pairs with one set of vocabulary cards between them. Ask them to categorize the vocabulary words, but don’t give them the categories. Partners should take turns placing each vocabulary word into a group according to the categories they created. Circulate and ask students why the cards in a group belong together. The connections they make through creating the categories help them remember the words and learn them on a deeper level. After the students have sorted the set of cards into different categories, have them write down the name of each category they created. Then have teams exchange tables or partnerships to view a different teams’ categories. Ask them to figure out what that team’s categories were. Finally discuss the various categories as a whole class. Like the simple childhood card game “War,” this interactive partner game requires two sets of vocabulary cards. 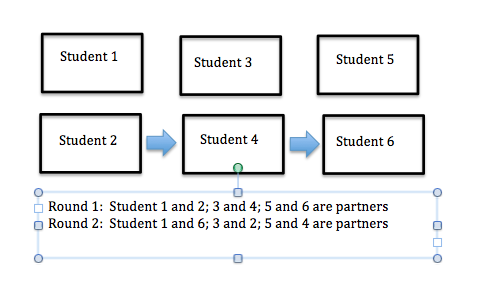 Have students sit with their partner at a table. Each partner turns over one card from the top of their vocabulary ‘deck’. Together students have to figure out how the two vocabulary terms are connected. They do not have to use both words in a single sentence, but they should try to explain any connection between the words. In this picture, middle school students work with words from a science unit on weather. If the students both turn over the same word, they should collect all cards back into their decks, shuffle, and start again! Notice the additional language supports for this activity. 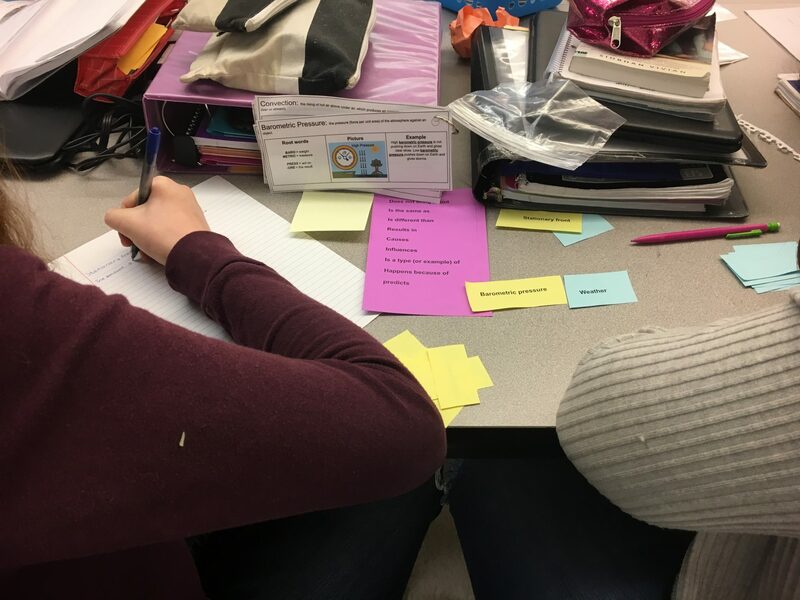 Middle school science teachers, Vanessa Thursby and Paula Stiles, provided students with the purple page that had sentence frames to help students figure out connections and write possible sentences connecting the two words. Another teacher, Natalie Kraft, had students create their own visual vocabulary cards for each word to support comprehension. Students placed the words for the unit on a ring and used these cards to support their interactions with the game of ‘war.’ When students figured out how the words were connected, they wrote sentences on sticky notes and posted them on the board. At the end of the class, the teacher used these sentences to review key concepts and connections. This cooperative learning strategy from Spencer Kagan is great for an interactive vocabulary review at any grade level. Have students choose one of the vocabulary cards from their deck that they know well and can explain to others. (Or challenge them to choose one they need more support with!) Ask students to review the word, practice explaining it to a partner, and prepare a sentence using that word. Now have students stand up with their vocabulary cards and find a new partner. Partner A begins by showing their word and ‘quizzing’ Partner B on the meaning and use of the word. If Partner B needs support, Partner A should ‘teach’ the meaning of the word and provide a sentence using the word. Now Partner B quizzes Partner A on the meaning and use of their word. Once both partners feel confident with the meaning and use of the words, they trade cards. They now become the ‘experts’ on a new word and find a new partner to quiz and teach. Students should continue with Quiz-Quiz-Trade for several rounds. This is a great activity to do as a warm up at the beginning of class or a review at the end of class. The strategy also provides great formative feedback as you circulate and listen to student explanations of the vocabulary. Note: This blog post was originally published on the Colorado Council of the International Reading Association (CCIRA). I have added a more specific information on supports and acknowledgement to the teachers in the Littleton Public Schools, Colorado, who implemented these strategies in their middle school classrooms after a workshop in February 2018. Kagan, S. (2009) Kagan Cooperative Learning. San Clemente, CA: Kagan Publishing.